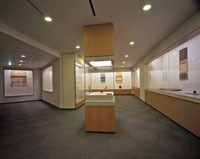 In the modern, well-equipped gallery rooms located on the first and second floors of the Urasenke Center building at Urasenke Headquarters in Kyoto, the Chado Research Center staff mounts two special exhibitions a year, one in the spring and one in the autumn, as well as other seasonal exhibitions. For the special exhibitions, catalogs are published and leading experts are invited to deliver lectures. As a permanent installation in the second-floor gallery, there is a replica of the Yuin tearoom at Konnichian, the historical Urasenke home. 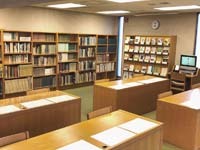 The Konnichian Library was established in 1969 by the 15th generation Urasenke iemoto, Hounsai SEN Genshitsu (Director, Chado Research Center), for the preservation and research of the chado-related documents collected by the successive Urasenke iemoto through the generations. The book vault currently holds approximately 55,000 books, magazines, and other types of works related to chado history, literature, religion, architecture, gardens, arts and crafts, and cooking. The public may freely make use of the books, reference works, magazines, and DVD and video resources that are available in the reading room. There is no loan service; use of the works is limited to within the library. Hours: Monday - Friday 10:00 A.M.-4:00 P.M.
Closed: Saturdays, Sundays, national holidays, August 13 - 16, and through the year-end and New Year's holidays (December 27 - January 6). *The galleries may be closed on other dates without notice in the case of severe weather. The Center building faces the east side of Horikawa street, 1/2 block north of Teranouchi street. No visitors' parking lot.